By optimizing all the processes in your warehouse, Apport WMS creates efficiency and overview. The system is configured to fit your company's needs, so your warehouse supports the overall strategy. From the moment, the item arrives, till it leaves the warehouse again. And everything in between. Apport WMS supports all the journey’s steps, creating an efficient warehouse management. When the product arrives at the warehouse, warehouse employees usually receives the product by using handheld terminals. Apport WMS is designed to make this process as simple as possible. Among the available functions are: – Reception registration. – Showing immediate order needs. – Supplier follow-up. – Traditional product reception with the gathering of relevant information. – Cross docking, etc. All functions can be modified for your exact needs. Apport WMS helps you optimize refillings and relocations, so that the support your business’ needs. Rules for refilling can be based on order needs, minimum-/maximum control at locations and so forth. It can also be based manually on the operator’s wishes. Relocations happen in the samy way – either automaticall or manually. With this function, Apport WMS helps optimize the warehouse in acordance to ABC-placements, reduction of wasted space, etc. After ended picking, orders need to be up-ranked and consolidated before shipping, just like the packing- and shipping lists need to be signed and the loading of orders completed. Apport WMS supports all assignments using integrated functions in the picking flow or with stand-alone solutions based on hand terminals or PC-stations. Apport WMS is fully integrated for common carrier applications such as Consignor or Unifaun, so that the necessary papers are printed automatically as an integrated part of the shipping function. Apport WMS always finds the optimal placement for any given item by basing the placement on the rules, you’ve given it. The placement can be defined from the importance of the item, the volume og a range of other criteria, that you define. The function can be executed on may different types of hardware. The possibilities for order picking are manifold, and the configuration is always based on the company’s needs. The possibilities for order picking includes, among other things: – Picking of single orders. – Batch-pick of orders, that demand subsequent processing. – Advanced picking directly in the shipment packaging, giving the system the ability to calculate the most optimal picking- and shipment method from carrier expenses, packaging type and employee salary/hours The picking can be done using a large range of hardware from traditional hand terminals to tablets and dedicated voice terminals. All picking registration – for instance batch numbers or serial numbers – can easily be registered continually. Apport WMS also supports various forms of picking for production, relay picking, etc. 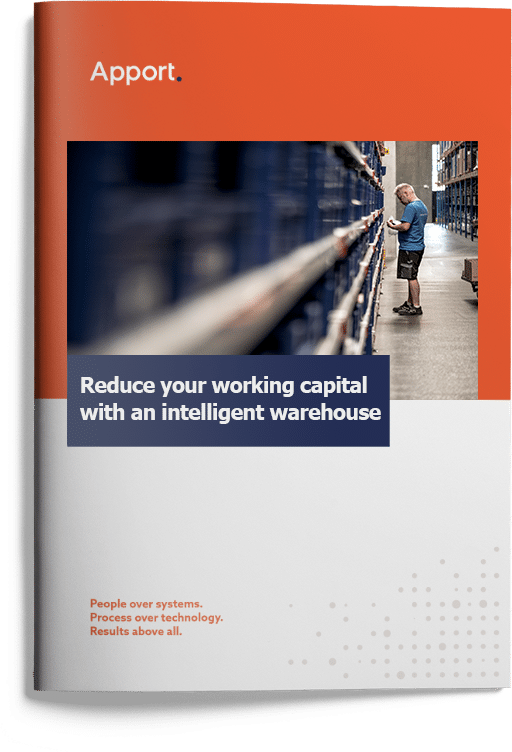 Apport WMS supports both manual, peridocic and continual stockttaking, and generally all countings can be done, while the warehouse is in full function. In doing so, you avoid the resource demanding, yearly stocktaking. Ongoing stocktaking can be configured as such: – 0-point-counts. – Counts that get activated as a result of a certain amount in a location – Counts that follow a predetermined cycle, depending on how often you want the item counted. The stocktakings can be varied in accordance to A-, B- and C-items, and also offer the possibility to do manual or periodic stocktakings, where select parts of the warehouse are accounted for. Manual countings can be done either as traditional “item on location”-counts or location counts. Apport WMS makes it possible to collect data and use these data to improve and make your decision making more proactive. Apport WMS gives you both the ability to have an advanced Business Intelligence solution – showing you data in real-time and an overview of relevant KPIs – and a more traditional reporting. Apport WMS can integrate with almost any ERP systeme on the market. We have our basis in a standard integration, but this can be adapted and adjusted for the customers and ERP suppliers wishes. The WMS solution involves a wide range of possibilities for integration with external automation units. This includes both simple warehouse machines, lane control, robotic control and complex solutions with the control of miniload cranes, goods-to-man stations, etc. Apport WMS cooperates with the best hardware suppliers of the market. Apport WMS supports voice-control (Apport Voice), which makes it possible for the warehouse employee both to receive orders and give back messages to the system using a headset. The voice recognition software is supplied by the American firm, Vocollect. The system can also be serviced using wireless hand terminals from, for instance Honeywell, that are easy to se and comfortable to work with.